here what you need to be enter into the drawing. For an extra chance to win.. I am a follower already here and I adore your Mother Goose card. 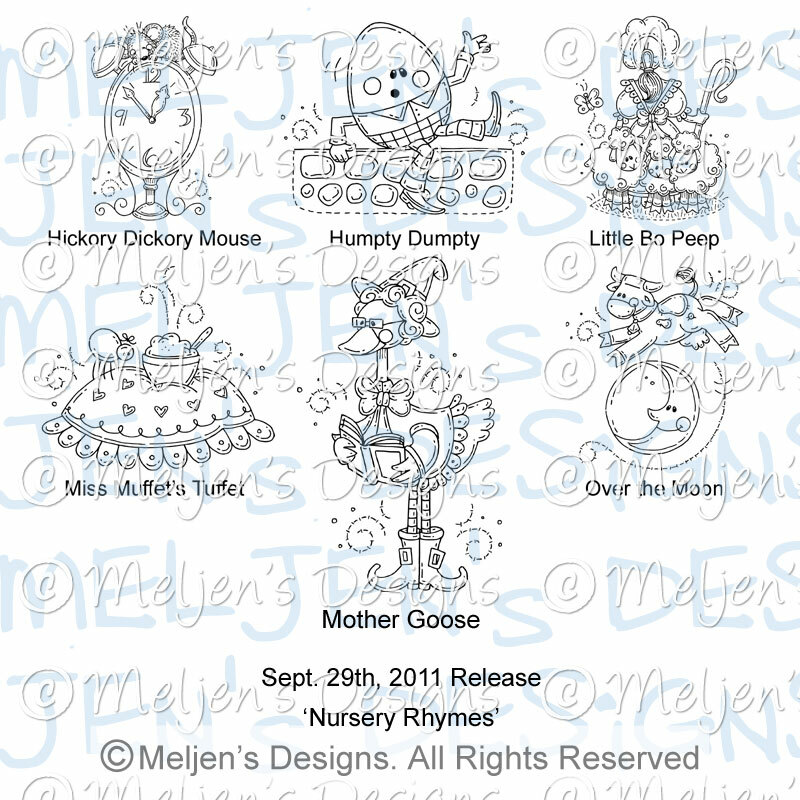 I became a fan on FB for Meljen's Designs. 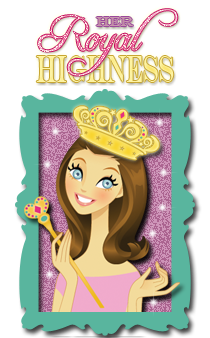 fabulous post Queen, gorgeous card, love your coloring! What a cute card your Majesty!! 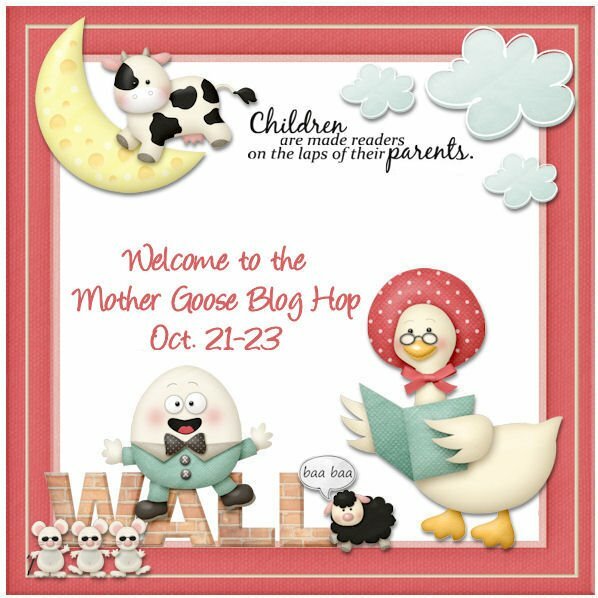 i love this blog hop, we forget how wonderful the Mother Goose rhymes are and the meaning of each of them is so special. I enjoy Nursery Rhymes. Love your cards. This is just ridiculously adorable! What a great card. Love the image and the pattern papers. I am now a follower of MelJen's blog. I have become a follower/subscriber of all the blogs in the hop. This was a great hop! Thank you so much for letting me hop along with all of you, my Queen! This has been so much fun, and I've loved learning about all my old favorite nursery rhymes! Have a great weekend, Your Majesty! Already a follower. Such an adorable card. Thank you for all the inspiration in your blog. your mother goose is adorable thanks for hosting this hop and having me along! Love love love this card Theresa! That image is so adorable and I love how you have colored her - she looks just like she should :) I am a long time follower of your blog and also of Meljen's and now I am a FB fan of hers also. What a fun hop this is going to be! love the image it is soo cute. your card is cute. Wow Theresa! That was such a fun hop! One of the best things about hops is finding new blogs to follow! I was already a follower of about half, but now I am following them all. So many great projects! Now I am wondering if I was supposed to come back here after the last day to make a second comment. Not sure I can visit all of them all 3 days, but am definitely going to try. Thanks for this fun hop! Your Mother Goose if fabulous!!! So very beautiful!!! I am already a follower here and I love your Mother Goose Card. I "liked" Meljen's Design inn FB and sent me lovely message. I'm back and seen so many lovely projects from everyone. Cute card! Loving this digi set! Thanks for all the digi and Prismacolor tips, I'm addicted! 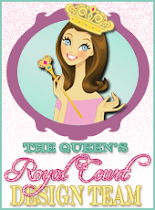 I'm a follower of the Queen (of course) and Meljen's Designs FB page! Thanks! Now following Meljen's blog! Thanks! Ok I'm back to let you know that I became a new follower to 7-8 new blogs to me. Yeah! More creative ladies to follow and be inspired by. Don't have facebook or twittersnd tried to follow Purple lion paper but couldn't and was getting an error trying to leave a comment. :(. Became a follower of Meljen's blog but like I said don't have Facebook so couldn't go and follow her there. Hope I get picked to win blog candy. Wow, what an adorable card! Love the colors and the playful look of it! Am now a follower, and I off to hop along the blogs. Have Liked Meljen on Facebook now. Her designs are fab! Am now a follower of Meljen's blog. Love the card, beautiful coloring, wonderful bling, great layering. Your majesty out did herself. Thank you for sharing your talents, and a chance to win. Im already a follower. I traveled to Meljen's Design Facebook page with your message. And "liked" what I saw. I then made the trip to Meljen's blog and became a follower. I'm back at the beginning! I've been to all the blogs and am now a follower of them. Lots of great projects, and I thank everyone for sharing with us! just finished the blog hop and loved it! Thanks so much and great DT!!! I am now a follower of each and everyone that I was not already following!!! Whew. Finished. What fun and great ideas. I think I did everything. I became a follower of all blogs listed in the hop. Went to Meljen's and became a follower there and also on FB. So many talented crafters and they were all so beautiful and it was nice to go back in time and recall all those sweet nursery rhymes. Thank you so much for an awesome blog hop. I just finished day 3...Thanks so much for a fabulous hop with so much creativity and so many nursery Rhymes that brought me back to not only my childhood but also to my children's childhood...thanks! 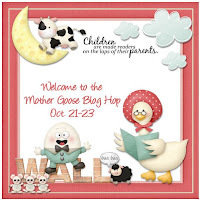 Love your whole Mother Goose Blog Theresa! You ladies are super talented. It is wonderful to see each womans take on "stories" that we have all remembered from childhood, thank you for sharing!